To me January has always been the bleakest month of the year: the holidays are over, it's cold and dark out, and you're stuck inside most of the time. I'm an optimistic person by nature, but I tend to be at my most grumpy in January. My January this year has been a little tougher than usual: two deaths of people I love (Grandma Cost and President Hinckley), my own grandma was suddenly hospitalized last week, and the recent disappointments of the presidential race. But it wasn't all sad. The good things included Peter's birthday, one or two pretty snowfalls, we got a new fridge and some new furniture, and John continued to grow and graduated from the crib to a toddler bed. I'm glad that January is now over and February is here. February to me is the last full month of winter, punctuated by a fun little holiday in the middle, with spring waiting to bloom on the horizon. The things I'm excited about that will be happening this month are getting our kitchen remodeled and John will be starting preschool in a few weeks at a good Montessori school we found. 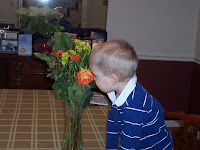 Here are some of my favorite pictures that I took in January that haven't appeared on the blog yet. I love taking pictures! 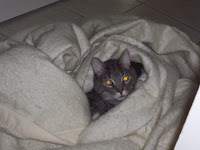 I know some people make fun of bloggers who put pictures of their pets on their blog. So you can tease me if you want, but I love my pets! This blanket was in the hall waiting to go into the washer and I found Brody cuddled up in it. He is such a mischievous little thing. 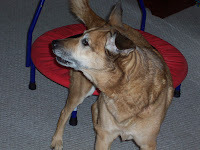 I have fun chasing him around the house trying to catch him so that I can hold him against his will! 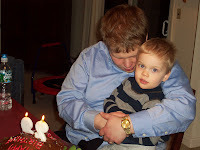 Was Peter saying a prayer or making a wish as we sang "Happy Birthday" to him? If I had to guess I'd say he's praying for whatever his wish is to come true. Check out Christy over John's shoulder. 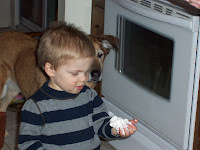 She's totally coveting that dollop of whipped cream on his hand. "No more monkeys jumping on the bed!" 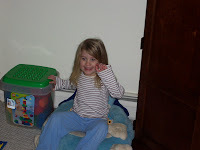 Good-bye crib, hello toddler bed! Peter is holding the remains of the crib in the background. 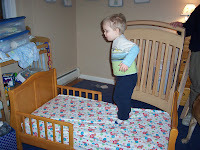 John was really excited to get his very own bed to jump on. 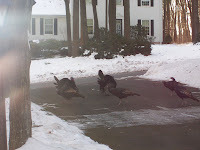 These are our pet wild turkeys. They roam into our yard almost daily during the winter months. We have fun watching them. They can fly like you wouldn't believe! How cute is she? This is John's cousin, Becky, at our house last Saturday. 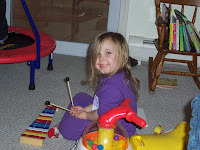 Bethany is also John's cousin and she will be a guy-magnet when she grows up. She's beautiful! 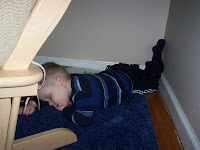 When John takes a nap he likes to sleep in the corner of his room behind the chair. I don't know why! He sleeps in his bed at night but he doesn't usually take naps in it. Peter is John's favorite person in the world. 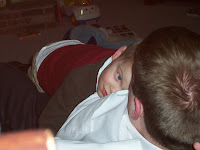 He loves his daddy so much. It's really sweet! I like how John is a little nature boy, even in the dead of winter! 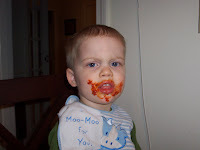 Mmmmm, pasta...delicious but messy. I don't think John wanted me to take this picture. He looks ticked! I love Christy. We've been together for a long time. She's my shadow. This photo is part of my documentation of a major project that I completed yesterday. It took me months, but finally, after 5-1/2 years, I got all of my wedding and honeymoon things organized and stored properly. 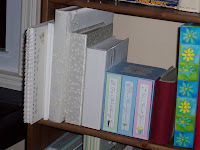 These are the photo albums and scrapbooks. In the basement now are three storage containers with all the mementos I wanted to keep. It was such a pleasant trip down memory lane to go through everything, but it was hard work to get it all organized and I'm so glad it's done forever! I hope you all have a wonderful February. Thank you for being faithful readers of my blog. It means a lot to me!